It's been 200 years since Napoleon ravaged Europe in the name of French nationalism, so maybe it's time to put aside the differences over all that warmongering and failed empire-building and all go to an amusement park together. France thinks so, at least. By 2014, construction is set to begin on Napoleonland, a new theme park designed to pay homage to the French leader some believe to be a hero and others think of as one of history's most loathsome dictators. Park-goers can expect a water show recreating the Battle of Trafalgar, tributes to Napoleon's crushing defeat of the Russo-Austrian Army at the Battle of Austerlitz, a ski run littered with the frozen bodies of soldiers and horses and a re-creation of Louis XVI on the guillotine  all of it on the site of one of Napoleon's greatest victories, the Battle of Montereau. 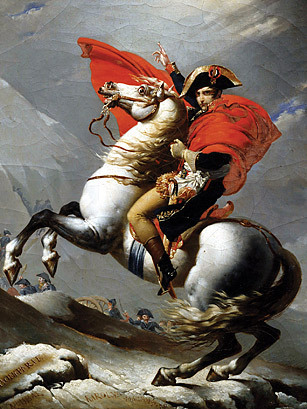 Even the Battle of Waterloo, which ended Napoleonic rule, will be featured. "It's going to be fun for the family," Yves Jego, the brainchild behind the park, told The London Telegraph. Indeed. After all, wouldn't Disneyland be better if its grounds were scattered with war casualties and 18th century beheadings?